• Power supply: 30, 50, 100 amp service. • Dog walk area with fire hydrant. Dogs must be on leashes! Check out is 11 AM. If you wish to check out by 5PM, then a DAY STAY rate will be charged. Arrangements must be made at the office to stay after 11 AM. Receive one night stay for free when you book three consecutive nights. The free night must be a weekday night (Mon-Thurs) and NOT a weekend (Fri, Sat, Sun) or any holidays. The free night must be used at the same time as your three consecutive nights. A maximum of one free night is allowed per seven day stay. The enclosed rules and regulations are in place for the safety of everyone. We would like to make your stay a pleasant and enjoyable one. Please be respectful and considerate of your neighbors and all other guests in the park and marina. Failure to abide by any of the rules and regulations will automatically and immediately terminate your stay and you will forfeit any and all monies paid. The Village reserves the right to change or modify these rules at any time without prior notice. Please do not dispose of your cigarette butts on the grounds. Use an ash can or other receptacle. We accept reservations for overnight stays only. There is a 2 night minimum for holiday weekends. At the time of the reservation, you will need to provide your power requirements (30, 50, or 100 amp service) and LOA including any swim platforms, pulpits or bow sprits as well as beam and draft. If your boat will not fit safely in the slip we assign you, we may not be able to honor your reservation. Please visit www.dockwa.com to make reservations, or call the marina office at: (631) 477-2200. Reservations must be cancelled by 11:00AM on the day prior to your arrival. Without providing 24 hour notice, the full amount of the first days stay will be charged. We monitor VHF Channel 11. Please call the Marina Office before entering the marina area. ALL boat owners docking at the Mitchell Park Marina must come to the office to check in as soon as they tie up. The floating docks can handle boats up to 70 feet. Larger boats are accommodated on the East Dock. Heads and showers are available. When you check in you will receive the codes to access them. Please be sure the door is shut firmly upon entering and exiting. The light switches are located behind the doors and are on timers. Please check the amount of time left if the lights are on when you enter. Please leave heads and showers in a clean and orderly fashion. Dumpsters are available on both sides of the marina. PLEASE DO NOT LEAVE GARBAGE BESIDE THE DUMPSTERS OR IN THE PARK LITTER BINS AS SEAGULLS RIP IT APART. This public marina is policed by the Southold Town Police Department and the Village of Greenport and all State and local laws will be enforced to protect the safety of marina patrons. Alcohol consumption and open alcohol containers in the Park are against the law. Greenport Harbor is part of a federal “No Discharge Zone.” ABSOLUTELY NO DISCHARGE IS ALLOWED. The pump-out station is located on the inboard side of the West Dock- look for the red and white sign. There is a $5 charge per tank for the pump-out service. If you need help, please notify the dock master or office using VHF channel 73. Rafting is not allowed in the marina. Rollerblades and skateboards are not allowed on the docks or in the park. Greenport does have a world class Skate Park located about one mile from the marina. The office or dock staff can give you directions. If a boat is in need of a repair, it cannot stay at the marina. The boat must be moved to a repair facility immediately. Call Brewer Yacht Yard, in Greenport at: (631-477- 9594) or Brewer Stirling Harbor Marina (631-477-0828) or Greenport Yacht and Shipbuilding (631-477-2277). For 24-hour emergency service call Douglas Marine (631-323-2645) or Eastern Long Island Sea Tow (631-765-6300). For all immediate emergencies call 911. For non-emergency police help, call Southold Town Police (631-765-2600). 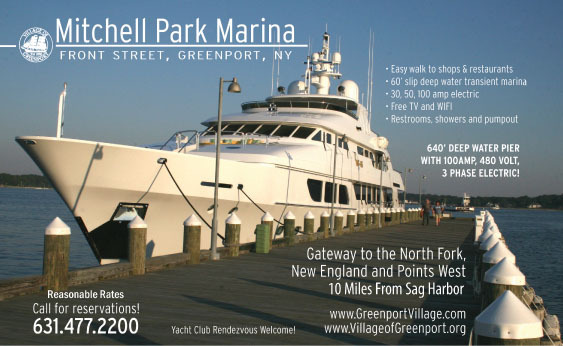 When asked for your location: Mitchell Park Marina is located on Front Street in Greenport. The nearest cross street to the floating docks is Third Street and access is from the Post Office parking lot. If you are located on the East Dock, the cross street is First Street and access is from behind the marina.